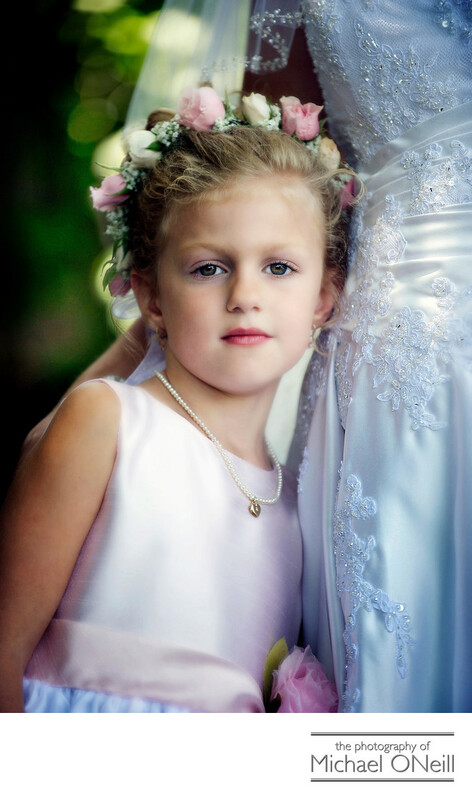 One of the prettiest of little flower girls I have ever had the pleasure of photographing. Such a beautiful precious face, the softest of skin and a perfect hairdo to compliment the wreath of flowers that matched those in the bride’s bouquet. The pearl necklace and gold locket was her gift from the bride and she absolutely adored it. As pretty as this little princess was, she was a bit camera shy. But so long as she was close to her aunt...the bride...she was happy to pose for my camera. I actually think that seeing her cuddled up next to the bride’s beautiful wedding dress makes the photograph better by being more intimate and capturing the bond between the bride and her lovely little bridal attendant.Little ones...flower girls, ring bearers, junior bridesmaids and junior ushers can add so much to a wedding party. Their cuteness and antics are enjoyed so much by your wedding guests. Photographing small children poses some inherent problems though. Though they may be little angels in the company of their familiar loved ones, oft times they are uncomfortable in the presence of a lot of strangers and unwilling to perform on command perfectly as adults do. It requires a lot of sensitivity and patience to work with small children on your wedding day. Not to worry. We will be with you for the entire event and if we don’t get the perfect picture at the perfect time we will eventually get a great picture when the time is right for the wee ones.This image was captured at a wedding that took place at The Hamlet Golf and Tennis Club in Commack, NY...home of the world renowned Hamlet Classic tennis tournament. The beautiful grounds, exquisite clubhouse & ballroom and phenomenal food & service makes this one of the finest catering venues I have worked at. I have photographed many weddings here as well as at their other properties: The Hamlet Windwatch in Hauppauge, Long Island and The Hamlet Willow Creek in Mt. Sinai, New York. If you are planning a Hamlet wedding and are looking for the perfect photographer with experience at their venue then give me a call. I would love to sit down and talk to you about your plans and ideas for the big day.